San Pedro -- Los Angeles Harbor. 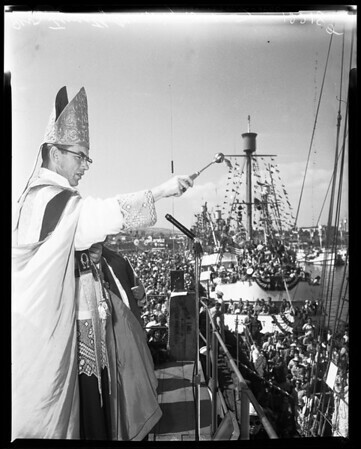 Two negs show Most Reverend Timothy Manning, auxiliary bishop of Los Angeles, blessing the Los Angeles Harbor fishing fleet. One neg shows girls tossing flowers into the water honoring those who have lost their lives at sea during the past years from the Los Angeles Harbor fishing fleet. One neg shows 'The Viking' which won the sweepstakes award and placed first in the non-sponsored, non-commercial classification. The Viking decoration was mounted on the fishboat St. Aniello 11, won last last year with a whale decoration. One neg shows Davey Jones Locker on fishboat commet, owned by Pete Bogdanovich, which took first place in the commercial division. Sponsor of the boat was Van Camp Fish Canning Co. One neg shows Viking of the Sea on fish boat Jo Ann owned by John Resich, sponsored by the California Fish Canners Association, which won the sponsored non-commercial classification of the contest".